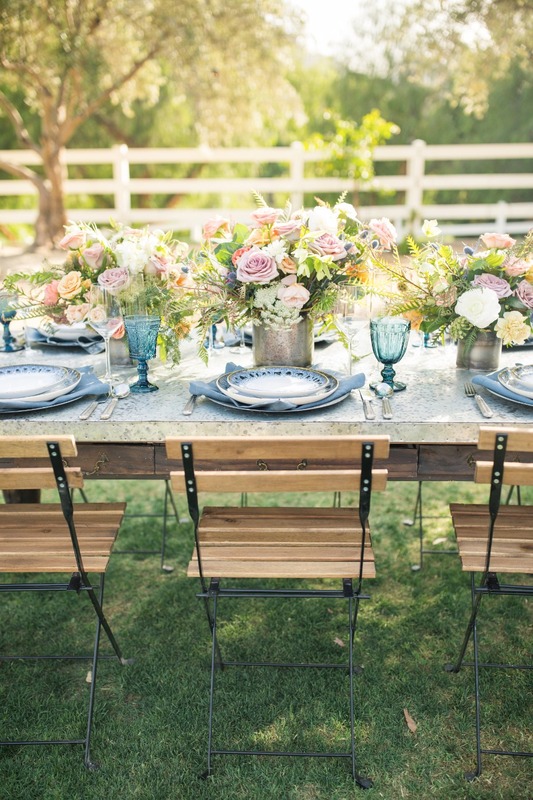 Personally I am not a girly-girl, and when thinking about a wedding, finding the delicate balance between the ultra feminine glam and the über rustic masculine is a big deal. 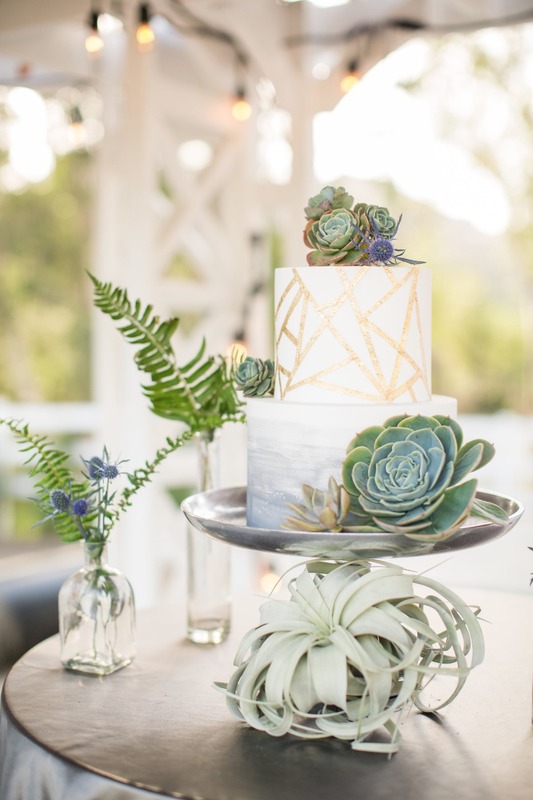 Why does it have to be either one OR the other? 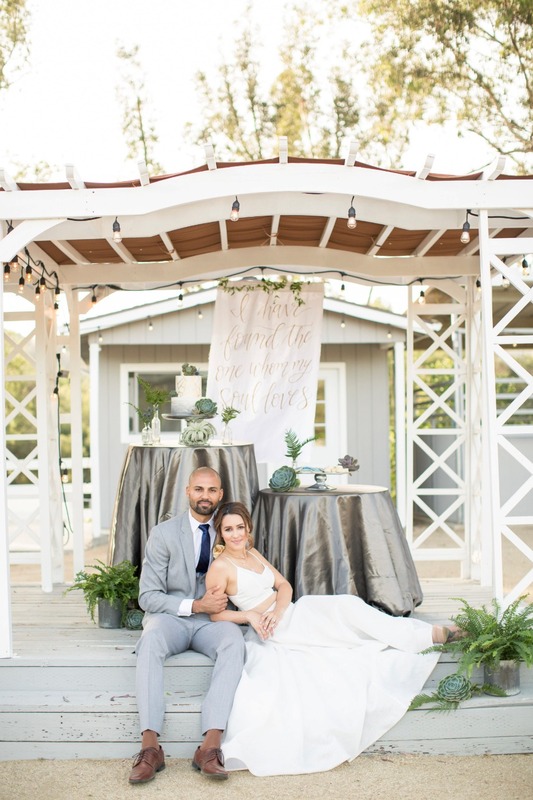 So when I came across this fabulous mixed metals shoot by Karen Marie Events and Katrina Jayne Photography, the genius way the decor spoke for both the male and the female nearly had me out of my seat with a standing ovation! 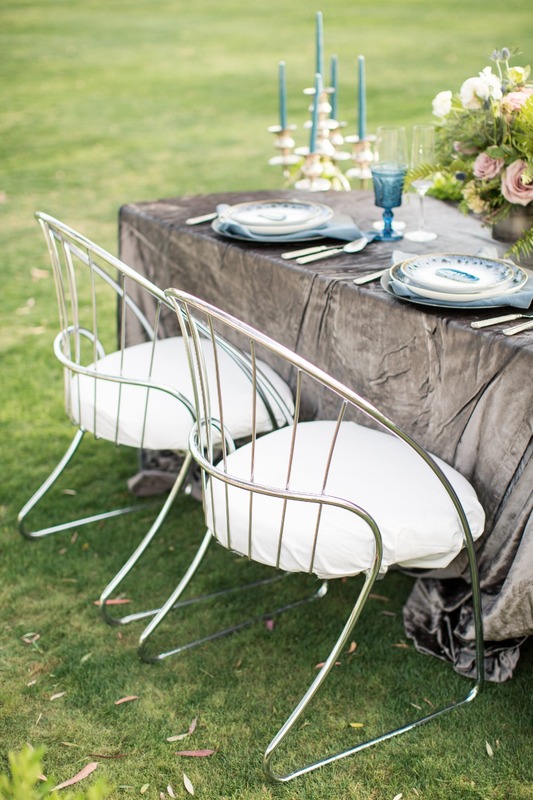 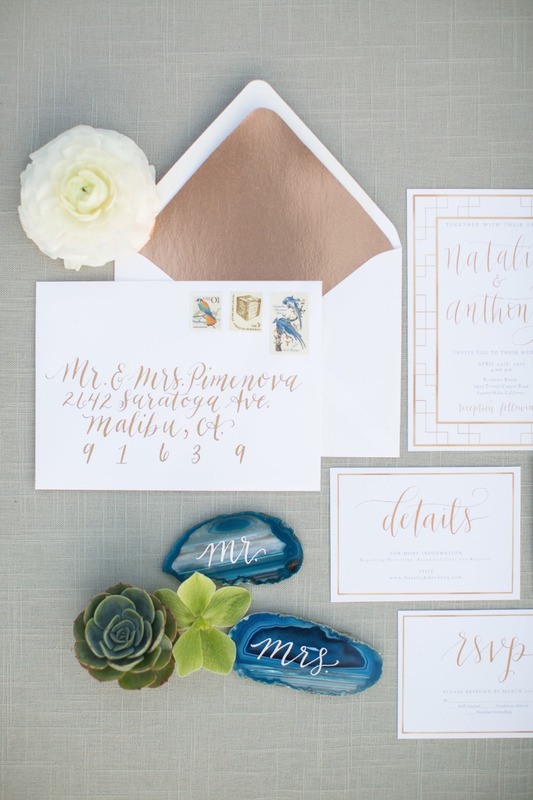 Metallics are the perfect way to add a bit of fanfare to your big day without the adolescent mess of glitter. 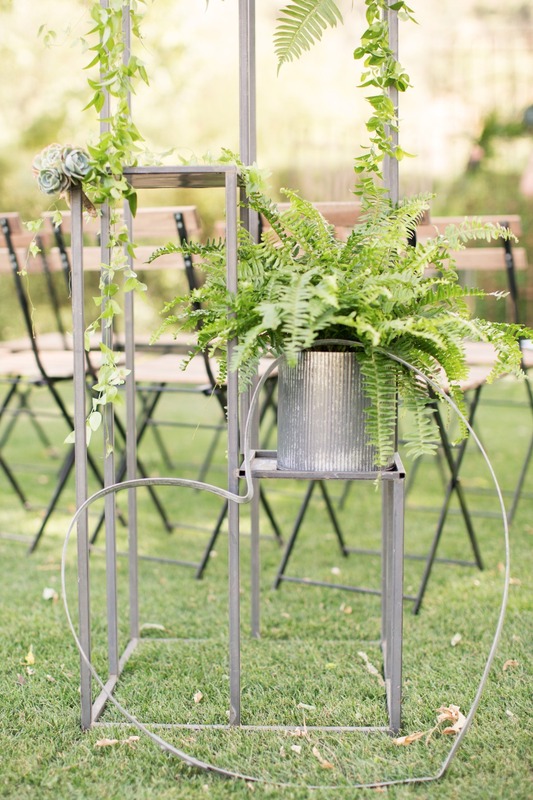 Plus that fun and funky industrial nature of metal anything gives your day a modern vibe that attracts just about anyone no matter their gender. 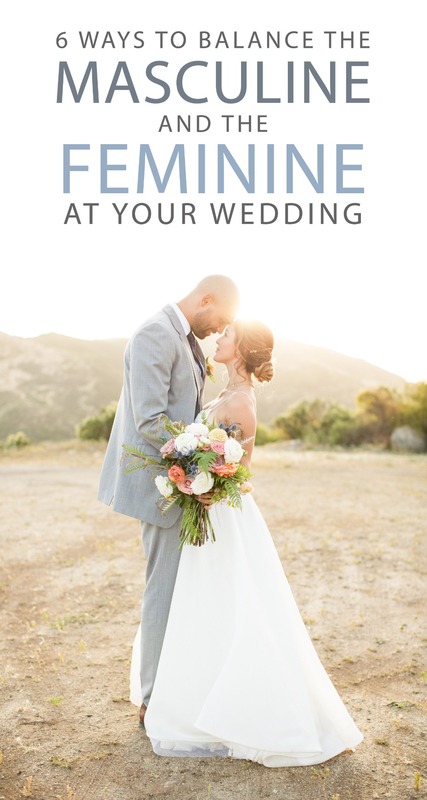 So get to scrolling to find 6 ways to balance the masculine and the feminine at your wedding! 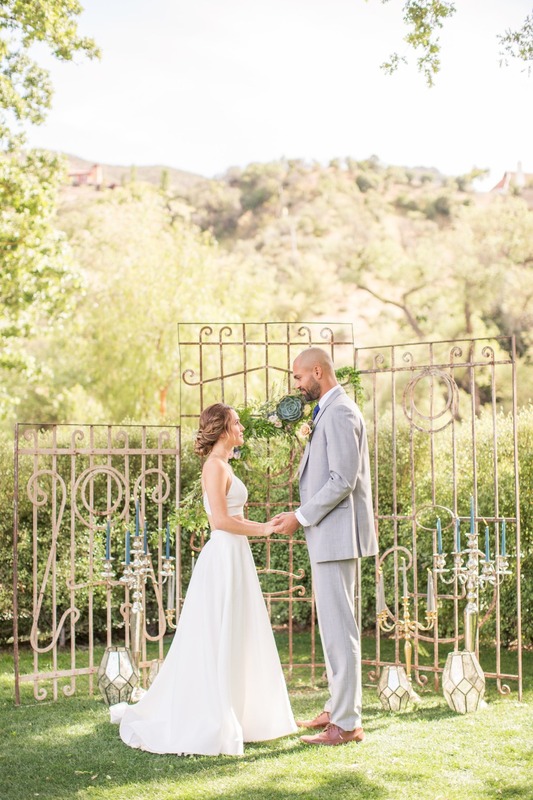 Oh and don't miss the full gallery of images; there is tons more to see there! 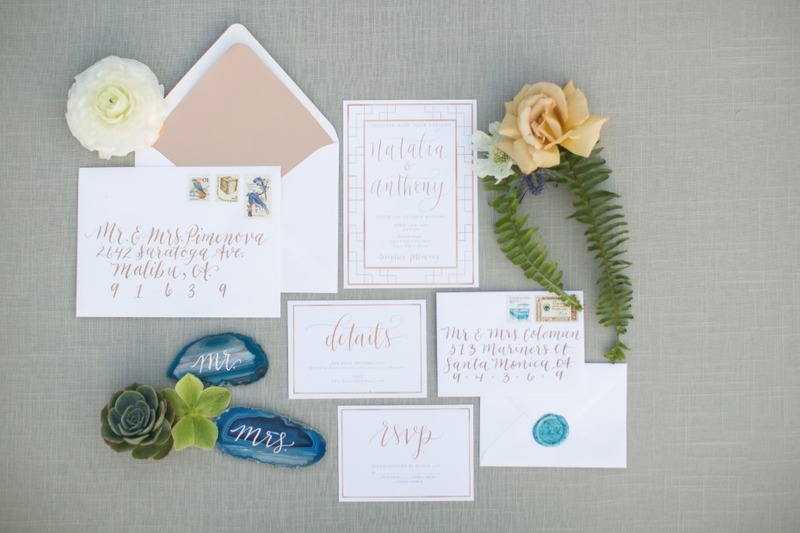 Your wedding invitations make the first impression for your big day, shouldn't they represent both of you? 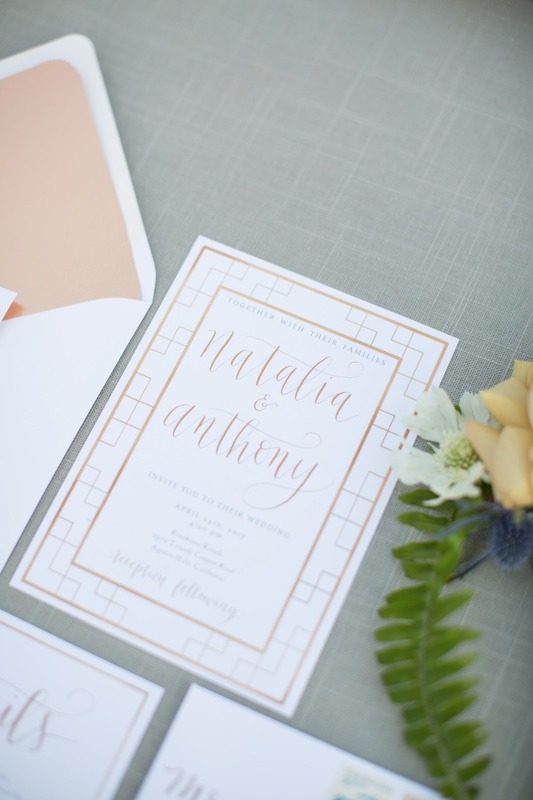 We are in love with this beautiful mixed metallic suite from Shelby Creative Design. 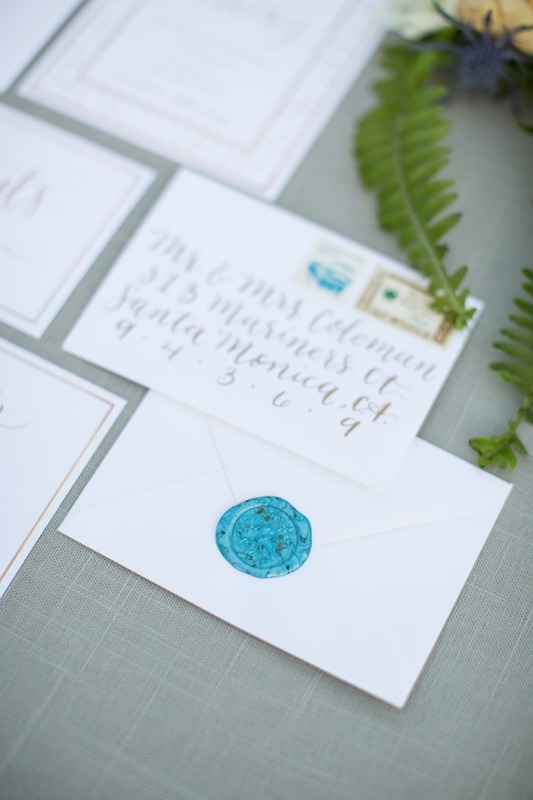 Not only is that copper envelope liner and calligraphy an eye catching detail, it also doesn't lean into an overly sweet and princess-like theme. 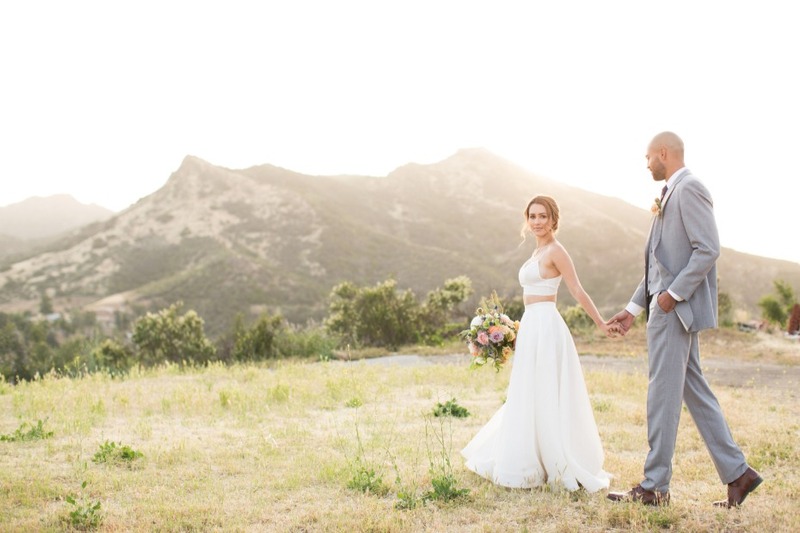 From Katrinea Jayne Photograohy: With the mixed metal theme, the modern clean lines of the bridal dress created by Juliette Kim of TheNewhite, a fashion designer from New York now in Los Angeles, was perfect. 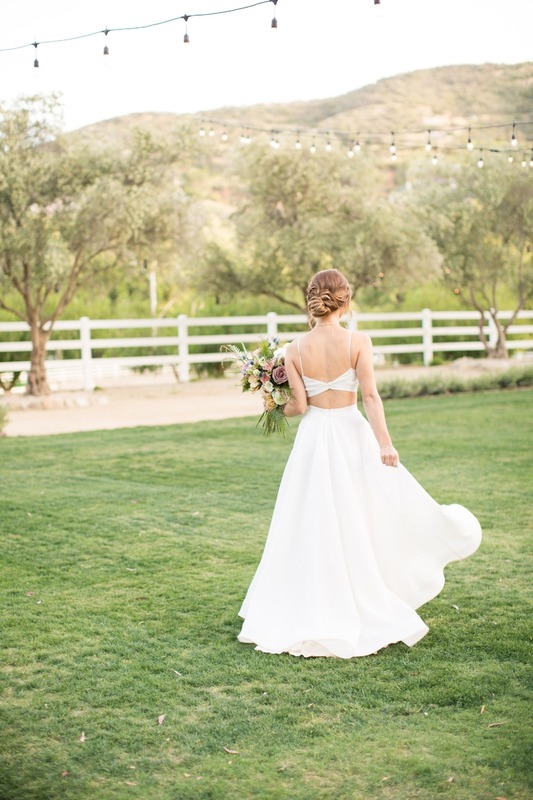 Her designs are timeless and clean in lightweight breathable fabric and this dress featured the “N” top and “A” skirt in textured organza. 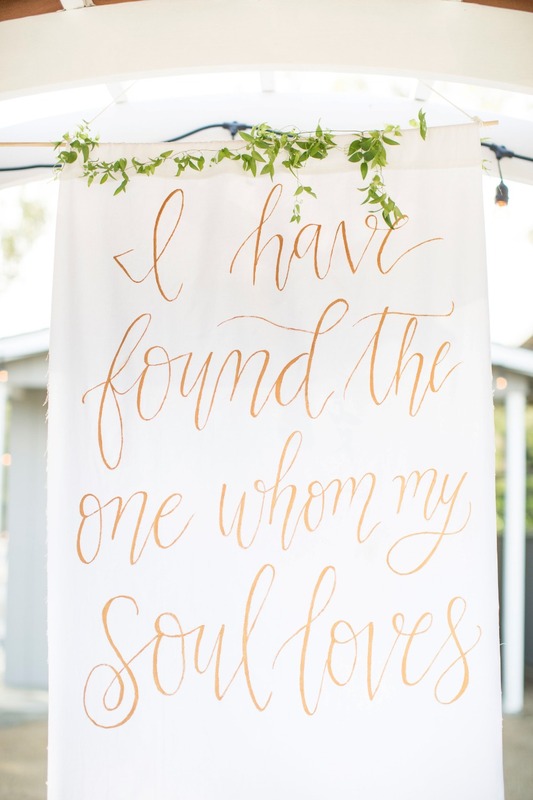 Delicate layers of handmade gold jewelry design including the featured long crystal quartz, known as the “master healer” amplifying energy, dripped down her neckline. 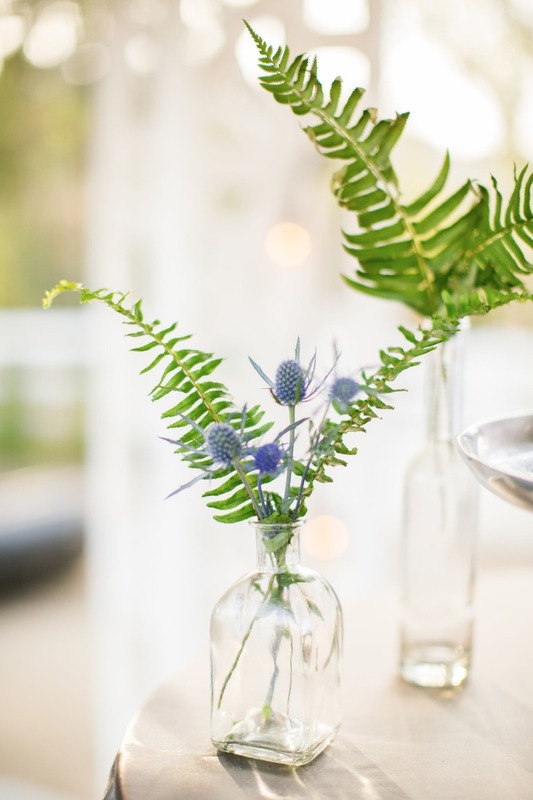 Provided by Fire and Honey Jewelry, they offer a handmade collection of simplistic pieces that are primitive yet modern in style. 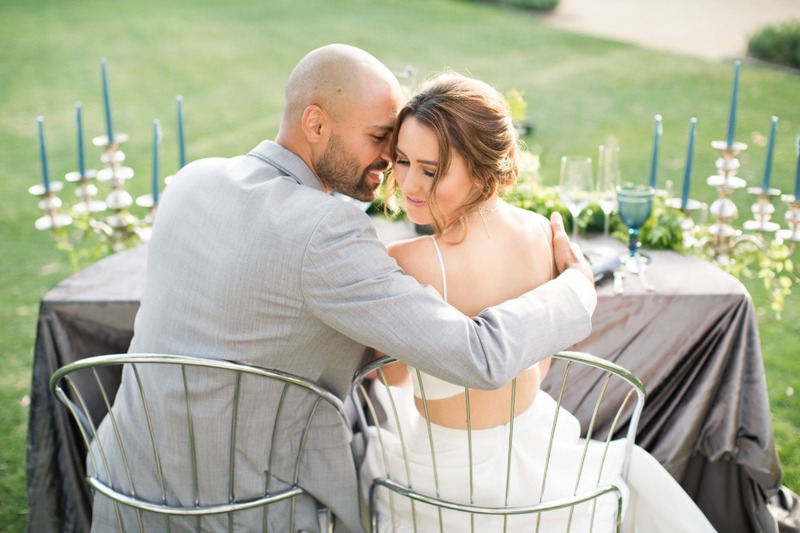 The natural makeup and exquisite updo design by Blushing Beauty provided the final touch to this perfect styling of our bride. 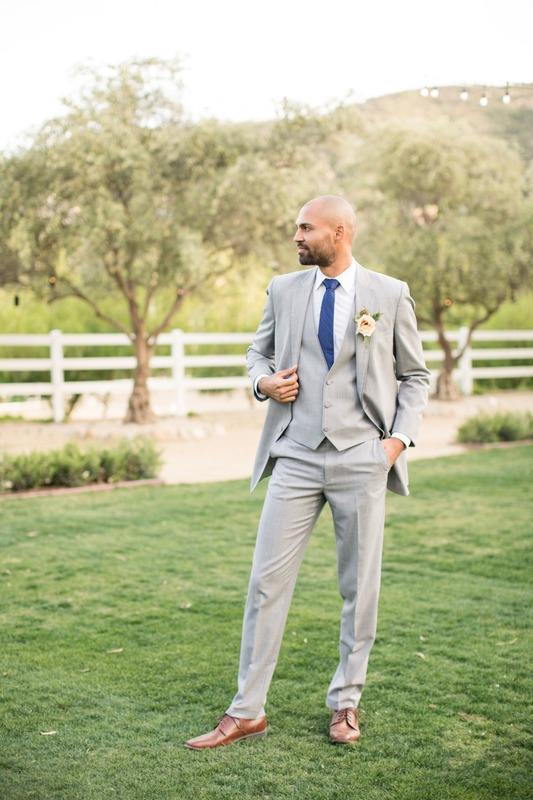 Suave and debonair in the clean lines of the heather grey notch lapel suit accented with a blue tie from Friar Tux made Darrin a perfect match with our lovely bride Stephanie. 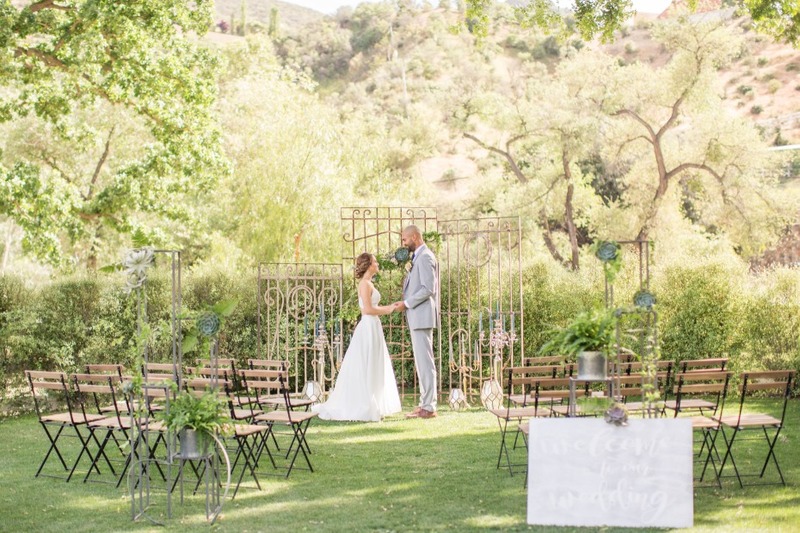 Rod iron gates towered at the altar area situated under one of the most expansive trees were delicately draped with natural greenery, air plants, and a variety of succulents. 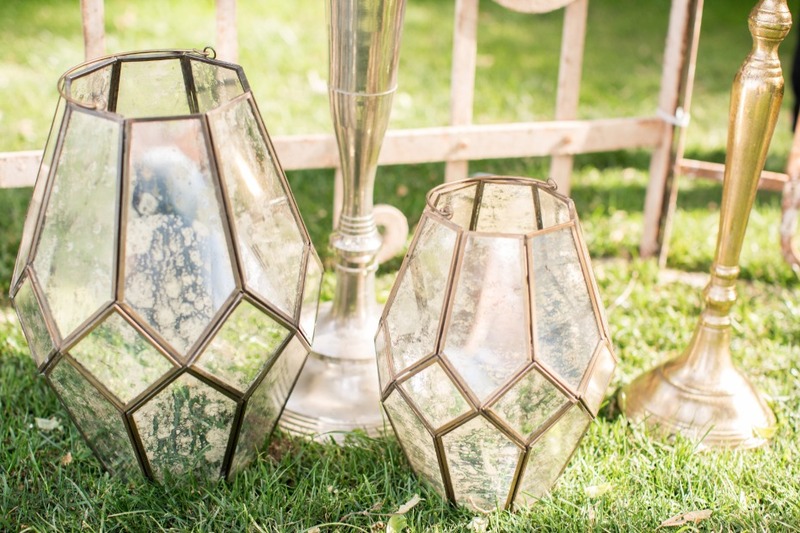 Propped against the iron wall, massive silver candelabras along with gold candelabras and geometric mercury lanterns made the initial statement for this metal mix theme. 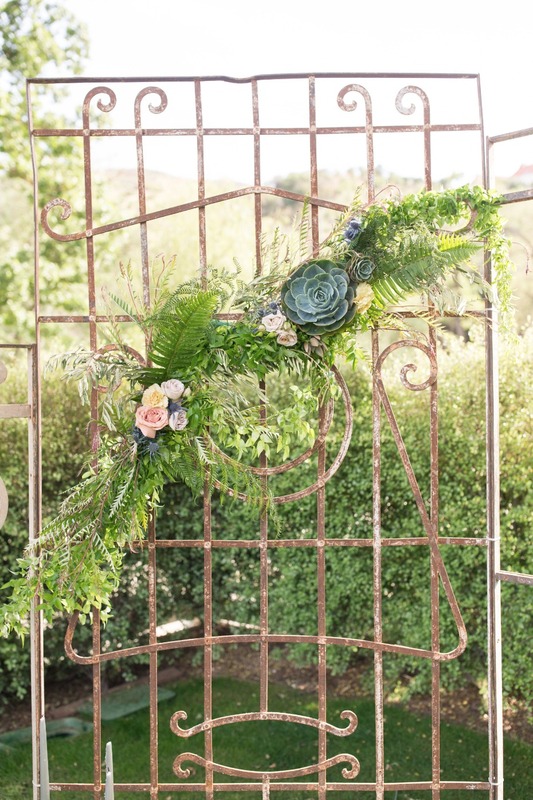 Carrying this theme further, Wildflowers CA brought in more of the natural green elements with ferns and succulents perched atop the iron decorative display pieces at the aisle entrance. 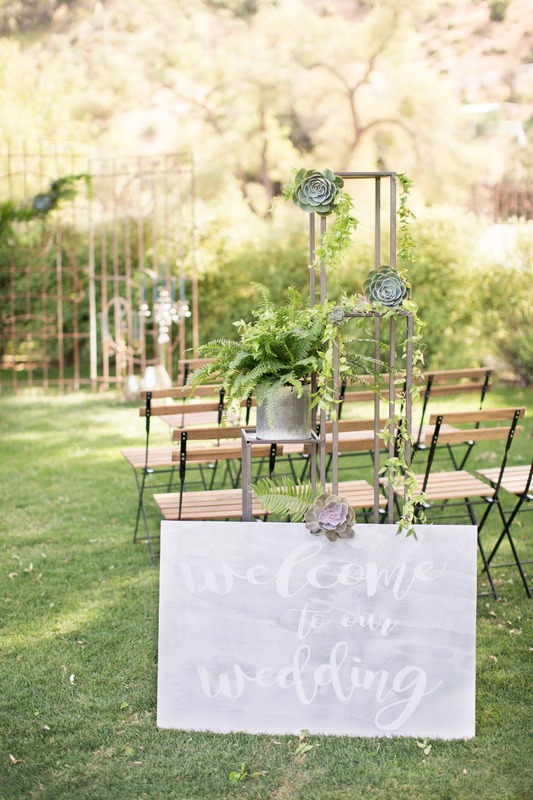 Café chairs added a final accent with wood slats and black iron frames along with the brush silver look of the “Welcome to our Wedding” sign. 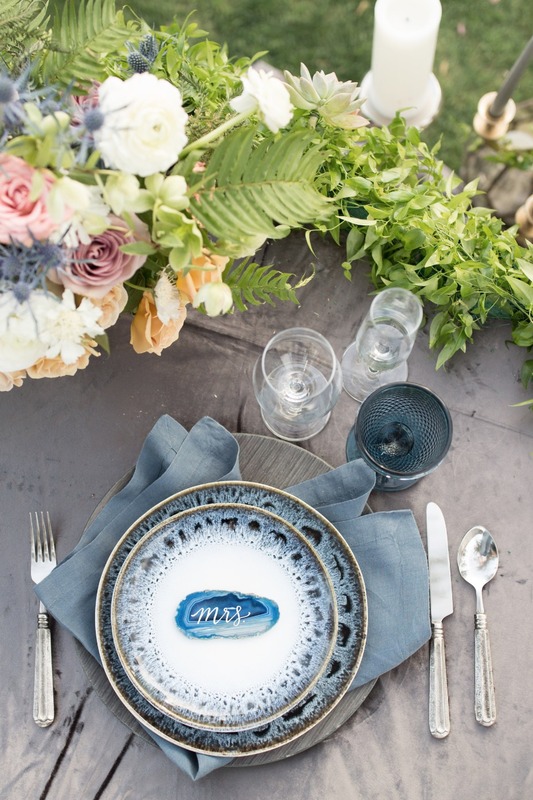 Finally, the tablescape, designed to be the showcase, definitely tied in the bluesy feel of this design. 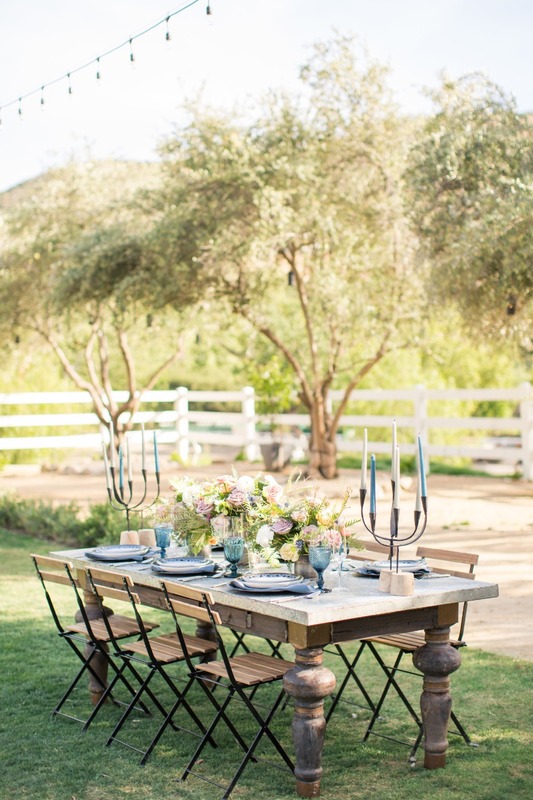 A gorgeous Zinc old world dining table with wood legs provided a perfect tabletop for this artistic arrangement. 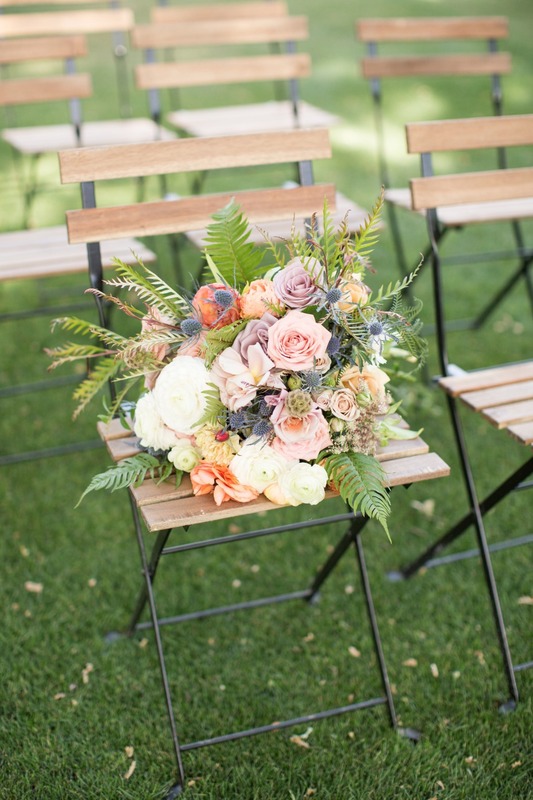 Three centerpieces bursting with various colors and of varying heights graced the center. 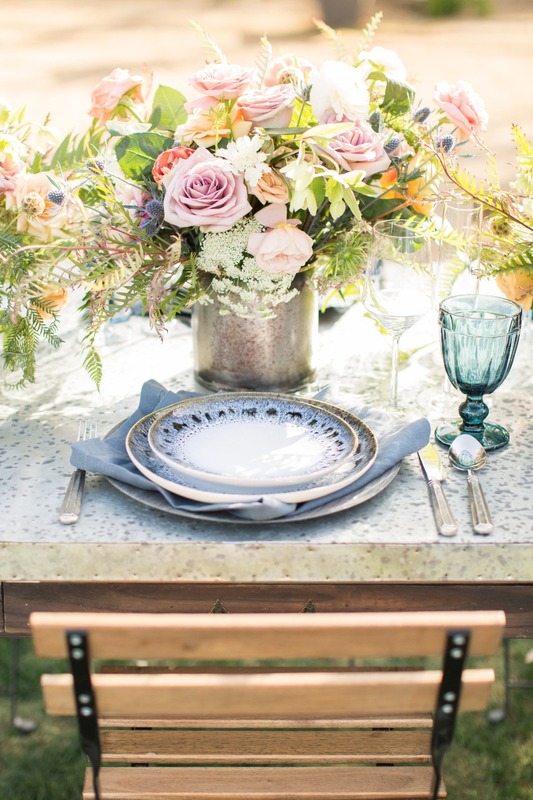 The muted color design featuring cappuccino, honey dijon, amnesia and butterscotch roses intertwined with Queen Anne’s lace, hellebores, beautiful ranunculus and blue thistle popping out made quite a statement on the table. 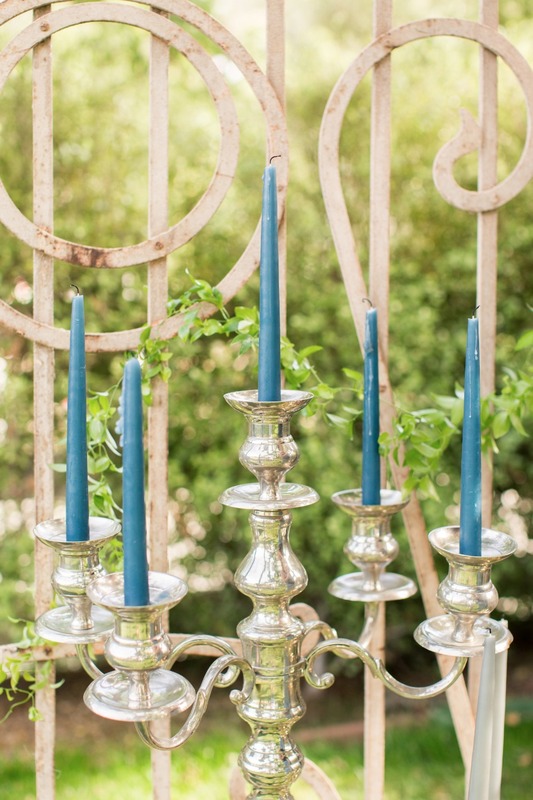 Modern iron branch candleholders with blue and grey candles highlighted both ends of the floral display. 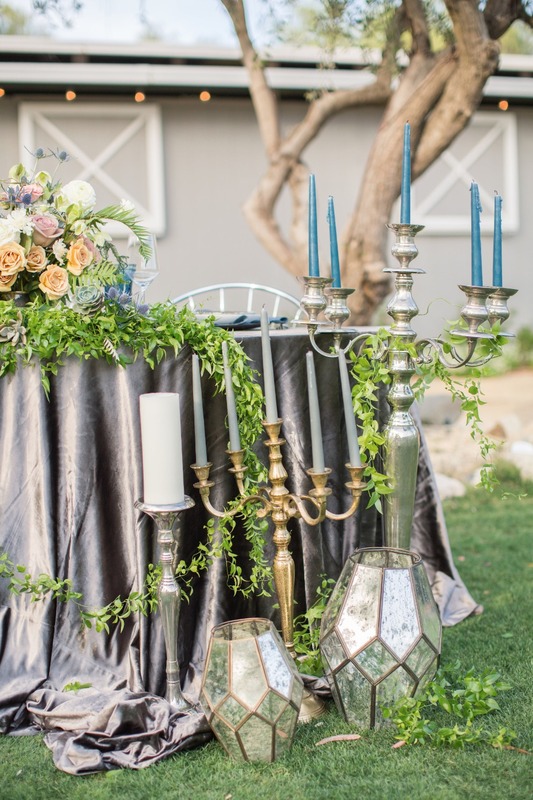 Old world brushed metal flatware and black iron modern candelabras repeated the mixed metal element. 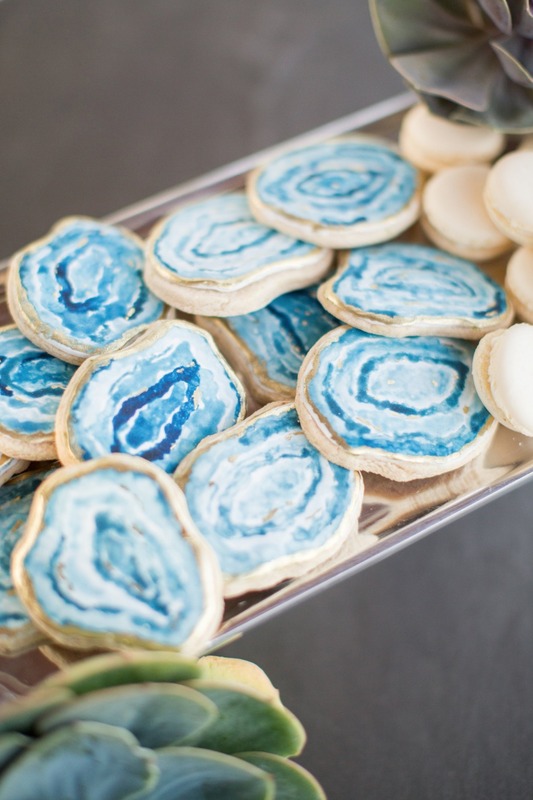 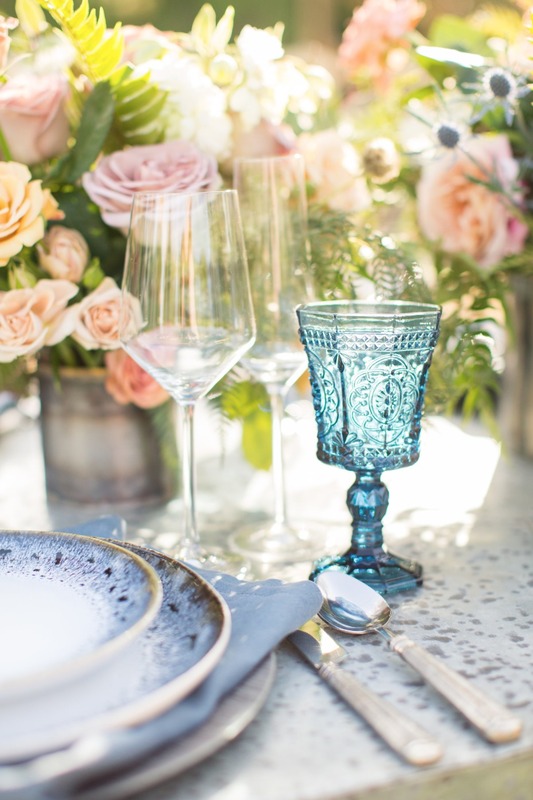 The artistic blue plates atop grey wooden chargers dressed with Indigo napkins flanked with the eclectic blue vintage goblets as well as modern clear glasses brought out the color palette. 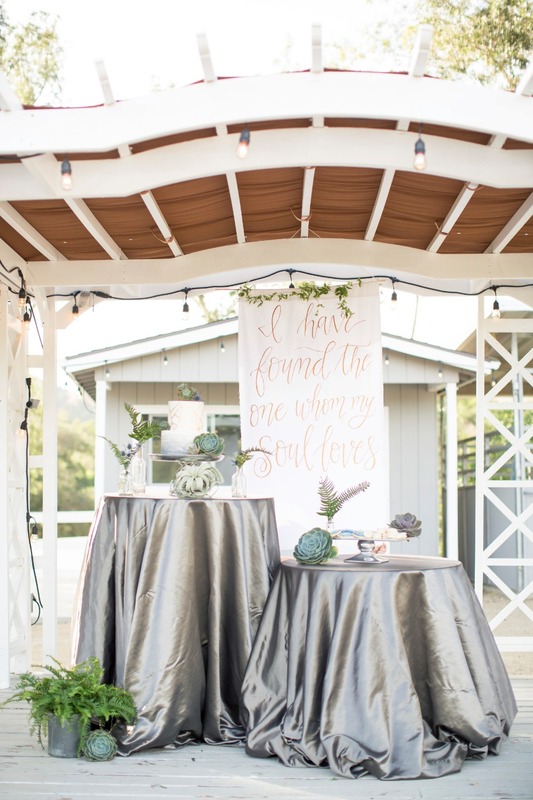 Taking some time to relax in the moment, our bride and groom enjoyed their private sweetheart table overflowing with a silver velvet tablecloth which gracefully pooled around their table. 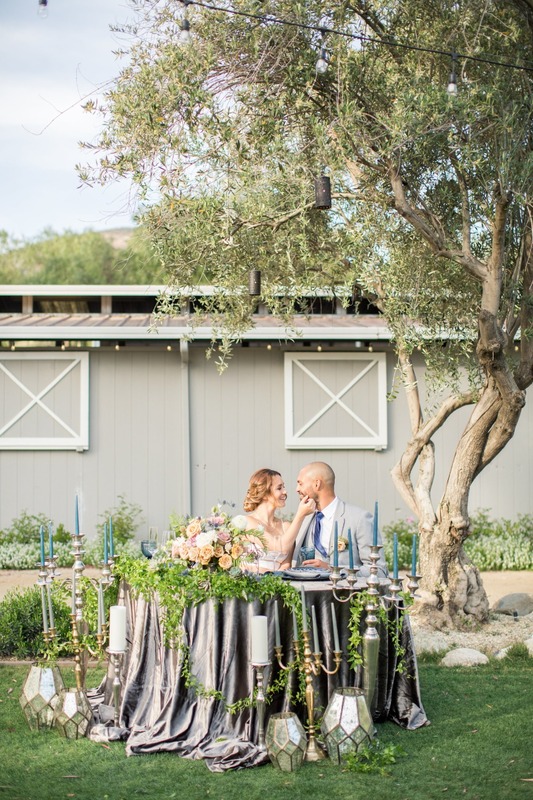 Lightly sprayed delicate greenery decorated the tabletop with a blue and grey table setting topped with extraordinary blue and grey Mr. and Mrs. agate pieces Decked with more mixed metals and lots of candles, it was most definitely a romantic centerpiece in the reception area.